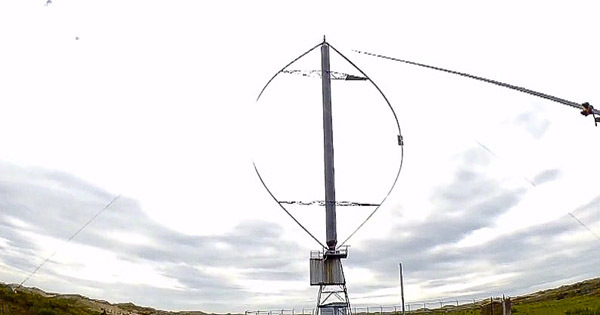 Someone sent me a link to a YouTube video titled Abandoned Vertical Axis Windmill In The Magdalen Islands. The 4-minute video was filmed in mid 2016 and shows a DAF-Indal Darrieus turbine standing idle on Iles-de-la-Madeleine in the Gulf of St. Lawrence. The video films some of the debris on the site and the interior of the ground-mounted drive train. Keen observers will note what looks like an old Carter 25 (10-meter diameter) downwind machine in the background later in the video. It too isn't operating. Both machines were probably abandoned by Hydro Quebec, the provincial utility, more than two decades ago--if not longer. The Darrieus turbine is a replacement for its infamous predecessor which proved that Darrieus turbines can be self-starting. The previous unit destroyed itself when the mechanical brake was removed for servicing and the air brakes failed to protect the turbine from self-destruction. See my books for more detail. I was on Iles-de-la-Madeleine in October 2005 for a conference where I was a featured guest. When our plane flew out we flew right over the turbine and I was shocked to see that it was still there. I'd thought it had been removed decades before. If I'd only known I'd taken a taxi out there and gotten some photos for my archives. I am still kicking myself for that lost opportunity. That machine, and the Carter nearby, both should be in a museum somewhere. They shouldn't be standing there derelict on the island's landscape as nothing more than a metal target for any Quebecois with a gun.